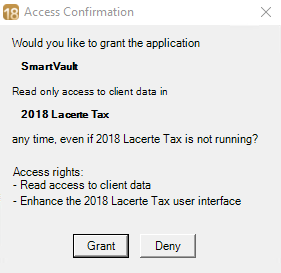 It's easy to connect your tax applications like Lacerte and ProSeries to SmartVault. SmartVault integrates directly with Intuit's Lacerte or ProSeries tax apps, and appears as a print destination. 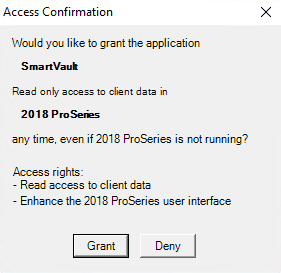 Before you can use it, you'll need to grant SmartVault access to Lacerte, ProSeries, or both. If you are a tax accountant, you'll primarily use the SmartVault Connected Desktop to manage your files. 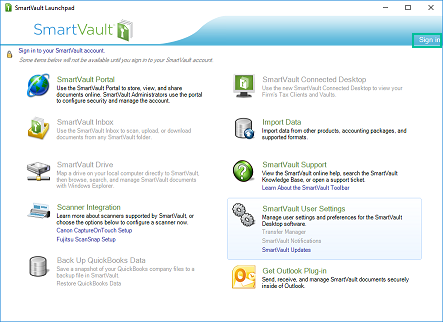 However, the SmartVault Launchpad lets you access to all the tools within SmartVault, including the Connected Desktop. Note: SmartVault supports all Intuit ProSeries 2013 and Lacerte 2013 tax apps and later. SmartVault does not support integration with Intuit ProSeries Basic tax application. 1. After installing SmartVault, double-click the SmartVault Launchpad icon. 2. Click Sign in in the upper right hand corner. 3. Enter your email address and password and click Sign In. As the Launchpad opens and you may receive one or more additional windows depending on the Intuit software you have installed. 4. Click Grant to allow SmartVault access to your installed Intuit programs. When you open the Lacerte or ProSeries print window, you'll see SmartVault as a print destination.